Streaming music service and Apple Music rival Spotify is in "advanced talks" to acquire audio distribution platform SoundCloud, reports Financial Times. Little information is available on the terms of the potential deal at this time. 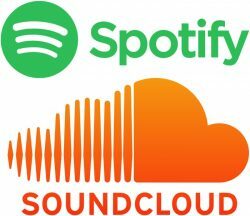 SoundCloud, which allows users to upload, promote, and share audio recordings ranging from music to podcasts, has upwards of 175 million total listeners a month, which could bring a huge influx of customers to Spotify and give it an edge over Apple. Spotify has 40 million paying subscribers compared to Apple Music's 17 million paying subscribers, but Apple Music's numbers have been growing steadily since its 2015 launch. Apple Music is also backed by the strength of Apple's subscriber base, which dwarfs that of most other music services and gives the company a huge pool of potential future subscribers. As competition heats up between Spotify and Apple Music, the two have become bitter rivals and have been involved in some public battles over issues like exclusivity, the App Store, and free listening tiers in recent months. SoundCloud recently introduced a new subscription service designed to compete with Spotify, Apple Music, Pandora, and other music streaming options. SoundCloud Go, priced at $9.99, gives users on-demand ad-free access to 125 million tracks, including premium licensed content. With a SoundCloud acquisition, Spotify could potentially add all of that user-created content to its own music catalog, giving customers more original content to listen to along with its existing licensed content. How can they afford this? Aren't they still operating at a loss? Huge fan of Soundcloud, one of the best places to get DJ sets. Smart purchase by Spotify if it goes through. This would be awful. SoundCloud is a place for aspiring artists and the like to get their content out to those that aren't behind a paywall and taking this away from them by purchasing their outlet would be disastrous. Plus I use SoundCloud and Apple Music in conjunction and if all that other music disappeared I would be sad. Seriously though, they need to make some profit before spending money. I was really hoping Apple would buy out Soundcloud. It's basically the "Connect" functionality they were hoping for with a huge community already using it. Wonder why Apple isn't buying Soundcloud instead. If they're willing to pay 3bn for Beats, SoundCloud would be a bargain and a drop in the bucket for them. And more importantly, Soundcloud has a much younger audience than Beats. It would be horrible if Apple purchased Soundcloud, because their game plan would be to absorb it. At least with Spotify we have a chance they'll leave it alone and find a way to monetize it. And then Apple purchases Bandcamp. Came to ask the same thing. Their investors must love the smell of burning cash. They paid 3bn for Beats Music's label contracts, Jimmy Iovine's contacts within the industry, and Dr. Dre's name. And the majority of the premium headphone market... it was a great deal all around.